How much did you pray this morning? How much do you tarry before the throne of God every day? This is the fifth year I’ve led Pursuit 21 … and never in these years has God laid a burden on my heart to emphasize prayer like He has this year. I don’t claim to know all of His reasons, but I do know this one: He wants us to emerge from this fast as men and women of prayer. As men and women who no longer abandon secret prayer. Beloved, when was the last time you spent thirty minutes in prayer? When was the last time you spent thirty minutes watching TV? The place and priority of prayer in our lives is quickly established. (Tweet this) I pray continually throughout the day, as I’m sure you do as well, but this is no excuse for not setting apart time just for prayer. God will not do for us what He would not do for Jesus – exempt us from the need to pray! If our Redeemer — the One who spoke this world into place, the Lion of Judah, the Lamb slain before the foundation of the world — found prayer necessary in God’s economy, then who are we to try to live by any other standard? Who are we to think that we can attempt to live without it? Prayer is one of the most noted characteristics of Jesus’ life. (Tweet this) It marked His beginning: At His baptism, it was “while He prayed” that “heaven opened” and the Holy Spirit descended (Lu.3:21-22). Prayer was a constant throughout His ministry as He often withdrew to the wilderness or to a solitary place to pray … even spending all night in prayer on the mountainside (Lu. 6:12). Prayer marked the end as well: As He took His final breaths in flesh, Jesus continued praying (Mt. 27:46; Lu 23:34,36). Does prayer mark your life like it did Jesus’ life? Or does the lack of prayer in your life betray a deep-seated presumption that God will exempt you from the need for prayer? When was the last time you tarried, lingered, labored, and persevered in prayer? I’m not excluded from the conviction of the Holy Spirit in this area. My secret prayer life has been woefully deficient. I’ve ached to have it return to me. I used to know what it was to wait on the Lord hours each day. Twists and turns and difficulties with my health in recent months have drained every ounce of drive I used to have … including my drive for prayer. Oh I’ve prayed … but I’ve not tarried. Not all night. Not all morning. On occasion, maybe. But not daily. In other words, I’m walking this journey with you. Flawed like you. Hearing God’s rebuke like you. Convicted like you. Repentant … and returning to Him like you. So Beloved, if the Holy Spirit is speaking to your heart, know that you’re not alone. We all need the Spirit of God to stoke the fire on the altar of our heart. We all need Him to revive us — and revival begins with repentance. With exposure of our sin. With returning to God. 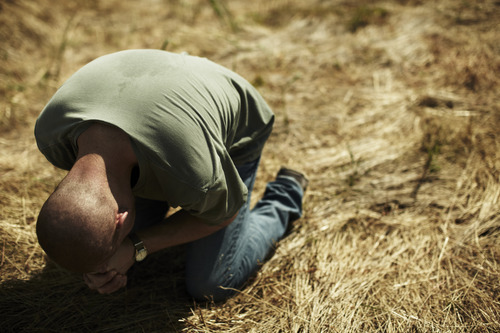 Are you convicted about your prayerlessness? Perhaps your fire for God has grown cold. Perhaps you used to be a man or woman of prayer, but your discipline in prayer has waned. Through fasting, you are allowing God to stoke the fire on the altar of your heart. I doubt many of us would be feeling the conviction we’re feeling about our sin of prayerlessness if we weren’t fasting. Most of us (myself included) would be allowing so many other things to dull our sensitivity to the life of Christ within us. But in fasting, we’re eradicating the two barriers to the Spirit of Christ erected by our carnal nature — the stubborn self-will of the soul and the self-gratifying appetites of the body. Now that God has really begun convicting us, let’s not decide that we’ll subject our carnal nature only so far. Let’s not conclude that He can convict our heart but He can’t have our schedule. That our day’s agenda is off limits. That giving Him our food is okay, but our time? No. We’ll keep that. Let’s let God bring everything in our lives into subjection to His Spirit. Everything. If you’re like me, one day’s emphasis on prayer is not enough. You need more. God certainly feels I need more because He is having me revisit sermons on prayer. Not any ol’ dead, lifeless sermon. No! He is taking me to messages with the Holy Spirit’s power and conviction on them. For the next few days, I will be posting sermons about prayer. On some days, I will publish two posts a day, one post being a mini-post containing a video message on prayer. Or if I publish only one post, I will simply include the sermon video alongside the worship video in the bottom of a the post. In the next few days, the posts may not all be solely about prayer, but I will share a sermon on prayer with you each day. I realize your schedule may not permit you to listen to a full-length sermon in one sitting. Divide it up, if you need to. Listen to part of it on your way to work and part of it on your way home. The Lord will help you find times that you can listen. It will be well worth it! Especially for the message below today. The following sermon is the one I referred to in yesterday’s post: Importunity in Prayer, Part 1 by Paul Washer. Paul is speaking to a group of ministers, but the message is applicable to all of us, no matter our vocation. “He prays not at all, who does not press his plea. Cold prayers have no claim on heaven, and no hearing in the courts above. (Tweet this) Fire is the life of prayer, and heaven is reached by flaming importunity rising in an ascending scale. “[In] the case of the importunate widow, we see that her widowhood, her friendlessness, and her weakness counted for nothing with the unjust judge. Importunity was everything. How much did you pray this morning? How much do you tarry before the throne of God every day? How much do you persevere in asking God? Do you truly believe He rewards those who seek Him?